The amount of water is incomprehensible. We’ve been flying for hours, and just when we’re about as far from a landmass as you can possibly get—a spot where the curving, wave-flecked Pacific Ocean stretches thousands of kilometers in every direction—an island slides into view. It’s no more than a snippet of sand and palm trees, a snake winding through the blue plain of the Pacific. Fanning out around it are 1,200 similar islands, some inhabited, others not, arranged into a constellation of 29 atolls like stars in a universe of ocean. For every square kilometer of land in the Republic of the Marshall Islands, there are 10,732 square kilometers of ocean. Roughly 2,000 years ago, voyagers sailing outrigger canoes discovered these smudges of land, and their descendants stayed, becoming the best navigators in the Pacific. While other cultures relied largely on the stars to find their way, Marshallese supplemented their astrological knowledge with an intricate understanding of wave dynamics and ocean currents. Boys floated on their backs for hours, memorizing the patterns beneath them. Later, far from home, they determined their location simply by the motion of the waves. Even on land, Marshallese life is defined by the ocean. Since few plants grow in the sandy soil, the majority of food is harvested offshore; Marshallese contains 50 different words and phrases for fishing techniques. The foods that do come from land—breadfruit, taro, the fruit of the spiky pandanus plant—are often fermented or preserved for seafaring journeys. Even the language is born of the sea: instead of using “right” and “left” to give directions on land, the islanders use “ocean-side” (the outer edge of the atoll) and “lagoon-side” (the protected interior). For generations, Marshallese called their home Aelõñ Kein Ad—“these islands of ours.” A few ships passed by, but the islands’ culture evolved in relative isolation until 1857, when the first wave of outsiders arrived: Christian missionaries bearing clothing, disease, and religion. By the Second World War, Japan had taken over the islands to use as a strategic base. The outer islands were bombed by Allied forces for 75 days. Blood seeped into the sand. And when the war was over and the islands ceded to US control, nuclear testing began. Between 1946 and 1958, the United States detonated 67 atomic bombs on the Marshall Islands—the equivalent power of 1.6 Hiroshimas a day for 12 years straight. Islands were permanently despoiled and entire communities forced into exile on other, less livable, islands. Cancer rates increased, and miscarriages and previously unknown birth defects became common. Through all of this, Marshallese culture adapted and survived. But today, it’s facing the one battle that might be impossible to win. Climate experts predict that because of rising sea levels caused by greenhouse gas emissions, the Marshall Islands could be uninhabitable by the end of this century. By the year 2100, it’s conceivable that climate change will force the entire population of the Marshall Islands to US shores. Already, more than 25,000 Marshallese—over a third of the population—have left the islands, many in the last 15 years. Among them was Sarah Joseph, now 22 and a resident of Enid, Oklahoma. Like Sarah, a surprising number of Marshallese migrants wind up landlocked in rural America, far from the ocean that’s shaped every aspect of their culture. Which raises the question: can Marshallese traditions and language survive without the sea? Or, in the words of the Marshallese minister of foreign affairs Tony deBrum, will climate change amount to cultural genocide? In 2006, I arrived on the remote Marshallese atoll of Ebon to teach English for a year. Sarah was the oldest daughter of the family I lived with, and one of my eighth grade students. She was smart and spunky, with a wide grin and dark hair in a floppy bun atop her head. There’s no telephone or electricity on Ebon, and only one store offering rice, flour, Kool-Aid, and Spam. But sometimes, when even the one road running the length of the island began to feel too crowded, Sarah would take a boat across the 100-square-kilometer lagoon to a tiny island called Demdol, where her grandfather lived alone in a one-room shack. She’d stay for weeks, on a patch of sand no bigger than a football field, reading a Marshallese Bible, scrubbing laundry on a washboard, and collecting eggs from the chickens that pecked beneath the palms. When I first met Sarah, she had just returned from Demdol. It was late August, and the days were unbearably hot. But evenings—when the sun slipped over the edge of the lagoon and the breeze rustled the palms and a string of coconut-shell fires glowed like jewels along a ribbon of land—evenings were everything I imagined living on a Pacific island would be. Sometimes Sarah would lounge in the hammock behind her parents’ house, strumming a beat-up ukulele and watching as the darkening lagoon mirrored the star-choked sky until the difference between the two became indistinguishable. It was as if we were sitting in a bowl of stars. As her mother, Rakki, stoked the fire, Sarah’s father, Jola—having spent the day cracking coconuts, drying the meat in the sun, and packing it into burlap sacks to sell for just a few dimes per kilogram—would slide his wooden skiff into the lagoon to fish. Most nights, we’d already be asleep by the time Jola returned with the next day’s protein. But occasionally, if a child in the village was turning one, Sarah, Rakki, and I would join a handful of other women and walk by moonlight to the mother’s hut to sing to the child. In the Marshall Islands, a first birthday is a significant milestone, and its celebration—which is much bigger than a wedding or funeral—is a remnant of the time when infant mortality was high. The event begins at midnight, with a chorus of women singing to the child, and concludes days later with a traditional feast attended by the whole village. On outer islands like Ebon, the food is often served in baskets woven from palm fronds, piled with fried donuts, balls of rice, sea turtle, fish, pork, taro, breadfruit, pandanus, and more. Instead of bringing a gift, attendees take something from the host family—a pair of sandals, perhaps, or a frypan—and carry it home. The less the host family is left with, the greater their generosity. It’s a testament to the strength of the Marshallese community, an understanding that no matter how little you have, you’ll be cared for. This was the world Sarah lived in for the first 14 years of her life. Looking back, it was paradise. But opportunities on Ebon are few, and the school only goes to eighth grade. Students from outer islands who pass a national exam and want to go to high school have to leave home, often staying in dormitories or with relatives in Majuro, the islands’ capital. Many never return. From 2006 to 2011, 17 of 26 outer islands experienced dramatic population loss, while Majuro’s population increased by 1,770, to about 28,000. Yet although Majuro offers education and jobs not available on outer islands, life there presents its own set of challenges. The reefs have been overfished or damaged by development—Majuro residents eat an average of 71.5 kilograms of fish per year, compared to 147 kilograms on the outer islands. Processed, imported foods make up the difference, but they cost money, and there isn’t enough paid work to go around. On any given afternoon, countless young men lean against buildings or lie on cool cement floors, smoking cigarettes and passing time. Each year, hundreds of Marshallese leave the outer islands for Majuro, and, each year, hundreds more leave Majuro for the United States. It was late spring, 2008. Sarah sat at the edge of Ebon’s narrow landing strip, wedged between the lagoon and the ocean. She watched for the white speck of an airplane to materialize in the blinding blue sky. She tried not to cry. Like most Marshallese in the United States, Sarah didn’t move because of climate change. She moved because of a lack of opportunities, and because her family said it was best. Back then, in 2008, climate change was still a phrase that few people in the Marshall Islands had heard. But Sarah’s timing couldn’t have been better. That December, the highest tides of the year coalesced with a massive storm, and three-meter waves swamped the Marshall Islands. Staple crops like taro and breadfruit were ruined, roads and seawalls washed out, and knee-high seawater surged into people’s homes. Graveyards flooded and tombs were destroyed. As with the world’s other low-lying atoll nations, Kiribati and the Maldives, the Marshall Islands have always been susceptible to floods and typhoons. Archaeologist Marshall Weisler calls low coral atolls “the most precarious landscapes for human habitation,” bar none. One flood in 1979 became so legendary in the Marshall Islands that elders told and retold stories of the ocean coming into their homes while they slept, waves battering their walls. The 2008 flood was intense, but many wrote it off as a similar freak event, the kind of natural disaster that visits the region every few decades. Except that the following year, in 2009, it happened again. And again. “Inundation events,” as they’re now euphemistically known, are no longer once-in-a-lifetime occasions. For the past few years, they’ve swamped vulnerable neighborhoods at least biannually and sometimes even more frequently, usually during the highest tides of the year. Sea levels in the western Pacific have risen by an estimated five centimeters per decade since the 1950s, and rainfall in Majuro has decreased by over a centimeter per decade. Droughts have become more frequent, too. The lack of rainwater—which people depend on to fill drinking water catchments and irrigate crops—is almost as troubling as rising sea levels. Mark Stege, executive director of the Marshall Islands Conservation Society at the College of the Marshall Islands, explains that alone, the Marshallese could withstand any one of these events. But stacked atop one another, there’s a threshold: a point at which people decide that the risk of property damage, the health and safety of their children, and the stress of living in fear, overpower the desire to stay on land that’s been handed down for generations, with their family and culture intact. Stege is creating models to determine where, exactly, that threshold lies. How much flood risk is too much? How many floods per year are too many? Though he hasn’t yet come up with an answer, he feels certain there will come a time when the Marshall Islands are no longer habitable. There won’t be a sudden exodus, a single moment, but over years or even decades, people will reach their personal threshold and leave. No one I spoke to knows anyone who’s yet left the country because of climate change. But the country’s first climate refugees may not be far off. When the US government bombed the Marshallese island of Bikini in the 1940s and 1950s—in the name of nuclear testing—the people who lived there were given a trust fund to help them relocate. Most were forced onto the barren island of Kili, one of the few spots in the Marshall Islands without a lagoon, a feature that buffers islands from the crashing waves. Because of this inadequacy, the island is particularly vulnerable to flooding, so Bikinians are petitioning the US Congress to use the trust fund to buy land in the United States. The fund set up to help them survive nuclear testing may now help them survive climate change instead. Yet the government refuses to consider a similar solution for the entire country. Doing so is akin to admitting defeat, and the Marshallese aren’t ready for that. Not yet. Undeterred, Minister deBrum travels the world, telling leaders and politicians that climate change can be reversed, that reducing greenhouse emissions can save the Marshall Islands from becoming a country of abandoned buildings being slowly devoured by salt and coconut crabs. Instead of seeking asylum, the Marshallese are embracing their heritage, clinging to the essence of what makes them islanders. Traditional tattoo designs mimicking the patterns of fish scales and ocean waves have become popular after decades of disuse. A program called Jaki-ed is reviving the art of weaving fine clothing mats from pandanus leaves. Stege is creating a digital Noah’s Ark, a record of plants and fish whose names could be lost. And more than 300 teens and young adults have graduated from a program called Waan Aelõñ in Majel that teaches them to build and sail dugout outrigger canoes. The program’s director, Alson Kelen, sailed one more than 3,800 kilometers, from Hawaii to the Marshall Islands, using only traditional navigation. A storm chased him for the entire three-week journey. But while cultural preservation and calls for climate action are vital to maintaining Marshall Islanders’ sense of identity, the latest report from the Intergovernmental Panel on Climate Change (IPCC) leaves little hope that such measures will be more than stopgaps. Mary-Elena Carr, a biological oceanographer with Columbia University, explains that even if carbon emissions stopped tomorrow, the lengthy lifespan of carbon dioxide in the atmosphere means that warming trends will continue unabated for the next 1,000 years. The official IPCC estimate is that global sea levels will rise between 26 and 98 centimeters by 2100, and Carr thinks even that is conservative. “I find it extremely unlikely that global average sea level rise will be below one meter by 2100,” she says. Either way, much of the Marshall Islands will be submerged. There’s a sea surrounding Oklahoma, too, but instead of a wave-flecked plain of blue, it’s a sea of farmland, a grid of fields punctuated by grain silos and pump jacks. One in five jobs in Oklahoma is supported—directly or indirectly—by the oil and natural gas industries, and as of last year, roughly 55 percent of adults in Enid, Oklahoma believed global warming is real. The national average is 63 percent. Oklahoma is also the fifth most popular state for Marshallese migrants (after Arkansas, Hawaii, Washington, and California), and it’s where Sarah moved after living with her aunt for six years in Arkansas and graduating from high school there. Though Enid seems like an improbable place for Pacific Islanders to settle, it is, in a way, familiar. The first Marshallese came here with missionaries about 40 years ago, and wrote home about the jobs that could be had in meat-processing factories, and the public schools their children could attend. Eventually, family joined family. In 2009, Oklahoma passed legislation that English would be the only language option for driving tests. Federal social benefits such as health insurance are unavailable to Marshallese migrants who aren’t citizens. Terry Mote, Micronesian community health coordinator for the Garfield County Health Department, told me his elderly mother caught pneumonia and was hospitalized soon after he brought her to Oklahoma. Without Medicare, her bill came to $10,000. He worked two jobs to pay it off. That Sunday, I see some of the same teenagers at the Marshallese First Assembly of God, singing Marshallese hymns and dancing beneath palm-frond weavings that look like sea turtles and the swirls of waves. After the service, there’s a party, but the only seafood to serve the guests of honor is some sort of fried fish brought in a cooler from Oklahoma City. So the pastor’s two adult granddaughters grab $40 from the collection plate, and I drive them down the road to an all-you-can-eat Asian buffet. There, the two Marshallese women, their tropical-colored muumuus standing out in a crowd of Midwestern farmers and roughnecks, fill take-out containers with steamed mussels. We joke sadly that this is fishing in Oklahoma. Sarah moved from Arkansas to Enid in 2013 when she got a scholarship to attend a community college. She lived with her cousin Ashlyn’s family in a crowded, dingy apartment on the west side of town. She wanted to study criminal justice. But one semester in, when she was 20, Sarah found herself pregnant. Carrying a child revived the debilitating homesickness she’d experienced in those first years away from Ebon. She missed the ocean more than ever, the smell of the coconut oil women rub into their hair, the wind in the palm trees, the cook fires burning in the night. She craved the fish Jola would bring home on a strand of fishing line, the pickled papaya Rakki made. Some weeks, the only thing in Oklahoma Sarah could stomach were chocolate shakes from McDonald’s. One day she drank 12. And then, on October 2, 2014, Sarah gave birth to a daughter, Marla Armonie Moana Lanwi. Like most Marshallese women, she didn’t cry out once while in labor. Sarah and her boyfriend, Nimo, who grew up in Majuro, were determined that Marla would celebrate her first birthday in the Marshall Islands. Nimo worked overtime at a meat-processing plant in Enid for a year to save enough for two round-trip tickets. So in March, when Marla was six months old, Sarah carried her onto a plane bound for the Pacific Ocean. When they were almost as far away from a landmass as you can possibly get, Sarah held her daughter to the airplane window so she could see, improbably, a ribbon of sand and palm trees snaking through the ocean: Aelõñ Kein Ad. These islands of ours. Sarah is not a poet. She’s not a climate advocate. She’s an average Marshallese woman doing her best to help her daughter understand that she is descended from the greatest seafarers the world has ever known. But later this year, after six months in the Marshall Islands, Marla—like so many Marshallese—will leave. By the time the next king tides beat against the flimsy seawalls and wash into people’s homes, she’ll be back in Oklahoma. Unlike many Marshallese-Americans of her generation, though, Marla will later be able to say that once, she knew the ocean. She sat on her mother’s lap at the edge of the lagoon and felt the tropical water tickle her legs. She took her first steps in her paternal grandparents’ gecko-green house that rises from the sea on a piece of land sprouted from oil drums and old tires. She looked into the eyes of the sea turtle that the men speared for her first birthday feast. And, the night before her first birthday, just before midnight, she watched quietly, her brown eyes wide, as a chorus of women and children streamed into the house strumming ukuleles and singing, welcoming her to the world. To her home. Travel for this story was made possible through a grant from Internews’ Earth Journalism Network. Krista Langlois participated in a Digg Dialog about this article on Monday, November 26, 2015. See the conversation here. Correction: The caption for the header image in this article originally identified the island as Majuro Atoll. It is actually Kwajalein Atoll. 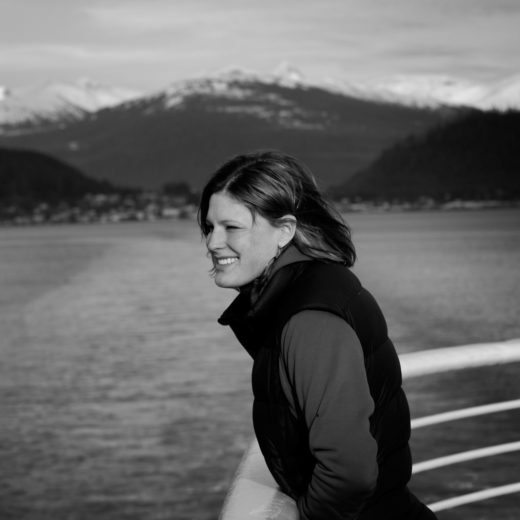 Cite this Article: Krista Langlois “Landlocked Islanders,” Hakai Magazine, Nov 16, 2015, accessed April 21st, 2019, https://www.hakaimagazine.com/features/landlocked-islanders/.